Not everybody gets to be Martin Luther King Jr. This point about how there’s only one Dr. King also applies to the struggle for LGBT rights, and inclusion in the United Methodist Church. 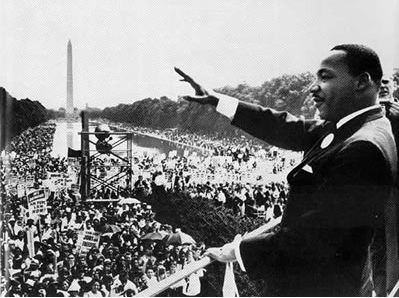 Now, consider this: In this picture, there’s only one Dr. King. Broadened out, even if you factor in the other leaders of the movement who were standing with Dr. King that day, not everybody gets to be one of them either. Most of the folks there at the March on Washington participated simply be being there. By showing up. Broadened out even more, that’s how the struggle for Civil Rights actually worked. It wasn’t just Dr. King standing like some Lone Ranger. It was everybody doing their own part. Some were leaders, like King. Others were legislators, like LBJ and our late friend Barefoot Sanders. Still others were foot soldiers in marches, and sit-ins, and acts of civil disobedience across the land. But there is one more category, and we must not forget it. It’s the group of folks who never did any of those things. But they quietly and silently allowed their hearts to be changed on the issue of Civil Rights. They watched in all on television. If they talked about it, they did so with family and friends, or at their own church. They started confronting racists jokes. They started pushing back against racists actions, in their own spheres of influence. And, actually, that is absolutely true. Not everybody gets to be Martin Luther King. But you are you. And you have your spheres of influence that God has given to you. You have your friends, family, church, etc. And you can do what you can do for the great causes of justice in our world today. You can speak up when the opportunity is there to speak up. You can act when the moment presents itself. Some of us are ordained leaders in the church. Others are layfolks. Whoever we are, and where ever we live, there are actions we can take that will be “edgy” for our own sphere of influence. He’s absolutely right. What you do. What you don’t do. What you say. What you don’t say. They all matter. That is a deeply clarifying moral light for me. I invite you to consider it as well. Because whether you believe the two struggles are metaphorically similar, your grandchildren will assuredly believe they are. So, no, not everybody gets to be Martin Luther King. But you get to be you. And as the world’s changes (not “if,” but “as”), what you do is truly important. So, speak up. Show up. Act. Whenever God gives you the chance.